MINI’s first plug-in hybrid is said to be almost production-ready, and looks likely to launch as part of the Countryman line-up. 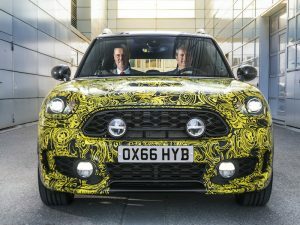 Previewed under camouflage, the near-series test vehicle has five doors and roof bars, suggesting a crossover, and is said to fuse hybrid driving with “MINI’s unique go-kart driving feel” and “catapult-like acceleration”. Details of the powertrain have not been revealed, but MINI has confirmed it will use a petrol engine at the front wheels and electric motor at the rear. This could see it utilise the drivetrain from the BMW 225xe Active Tourer, combining a 1.5-litre three-cylinder petrol engine and electric motor and offering four-wheel drive. MINI has not revealed economy figures either but emphasises that its first plug-in hybrid model is not solely focused on efficiency, but also on “driving fun”. Auto eDrive standard mode permits speeds of up to 50mph using battery power, whilst in Max eDrive mode speeds of up to 78mph are possible. A Save Battery model can also be deployed to ensure the battery retains charge at a constant level or increases charge via a generator. The test car bears few visible signs of plug-in hybrid status, with just the start/stop button marked out in yellow instead of red and a power display instead of the trademark rpm counter in the instrument cluster. The carmaker has also discretely located the charging socket for the high-voltage battery on the left-hand front wing. In addition the chassis and suspension have not been changed from the conventionally driven model variants – in fact MINI says the hybrid concept brings handling benefits due to the positioning of the eDrive components very low down at the rear, lowering the car’s centre of gravity and ensuring weight is evenly balanced between the front and rear axle.